Hypothyroidism, or low thyroid function, is one of the most common canine hormone imbalances. This was not always the case. In recent decades, hypothyroidism diagnoses are on the rise. In this episode of Pet Talk, Dr. Sarah gives advice about how best to care for dogs that have already been diagnosed with hypothyroidism, as well as provides the steps you can take to ensure that your dog has the best chance of staying healthy. 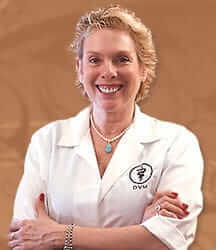 After you watch the video, click here for more information on Canine Hypothyroidism by Dr. Sarah. In mammals, the endocrine system is a system of glands, each of which secretes a type of hormone directly into the bloodstream, that regulate the body. The thyroid gland, one of the largest endocrine glands, controls how quickly the body uses energy, makes proteins, regulates calcium and controls the body’s sensitivity to other hormones. The thyroid is critical to metabolic processes and affects the functionality of almost every other organ in the body. The endocrine system is highly sensitive, and its delicate dance of hormones can be disrupted, potentially resulting in disease. In dogs, the most common hormonal disorder diagnosed is hypothyroidism. The holistic approach to veterinary care has different meanings for different people. Essentially it means just what the name indicates - looking at “the whole” and not the individual parts. Holistic practitioners consider the whole of a companion animal’s being and how every discrete part works in relation to every other part. Fundamental to this mindset is that everything is interrelated and nothing occurs in isolation. Furthermore, holistic veterinarians don’t only focus on physical aspects, they also consider the emotional, mental and spiritual elements. Holistic health boils down to balance; imbalance leads to dis-ease. It’s important to remember that physical signs of illness may often be the last to appear, and that mental and emotional imbalance can lead to disease, too.